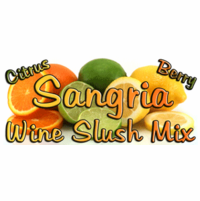 Sangria Vino Slush Mix by All Mixed Up, Ltd. Product Details: Transform an ordinary bottle of wine into a cool party drink! Just combine the mix with a bottle of wine and water, freeze, and serve. Our classic Sangria flavor features berry, orange, lemon, and lime flavors. Made with real fruit juices. To make a Wine Slush pour mix into a gallon-size zip-top bag and add 2 cups of water and a 750 mL bottle of red wine (recommended), white wine, or champagne. Seal bag, knead to mix, freeze 8+ hours, knead bag to break up into a slush, serve. To make a Virgin Wine Slush pour mix into a gallon-size zip-top bag and add 5 cups of cranberry juice (recommended) or white grape juice. Seal bag, knead to mix, freeze 8+ hours, knead bag to break up into a slush, serve. To make a Sangria Daquiri blend mix with 4 cups ice, 1 cup water, and 1/2 cup rum in a blender until smooth. To make a Sangria Margarita blend mix with 4 cups ice, 1 cup water, and 1/2 cup tequila in a blender until smooth. Ingredients: cane sugar, lemon juice powder, orange juice powder, less than 2% of the following: citric acid, red #40, artificial flavor, lime oil. Packaged in a facility that also handles wheat, milk, soy, egg, sesame, peanuts, and tree nuts. Features: Gluten Free. Vegan. Handcrafted in small batches, from our own original recipe, in Ohio, USA. Shelf Life: 3+ Years. Store for 5+ years out of sunlight, below 70 degrees Fahrenheit.